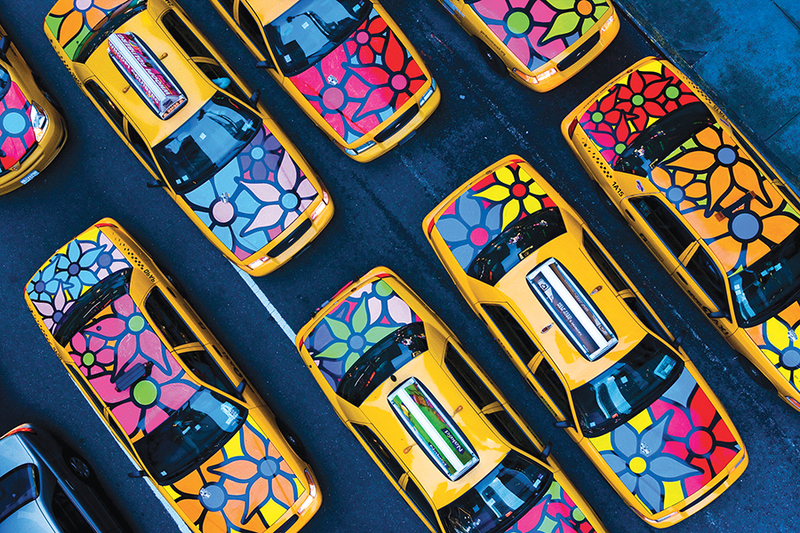 You may not know artist Ed Massey personally, but chances are you’ve seen him driving through town in his yellow New York taxi with the flowers on top. Massey and his brother, Bernie, are the masterminds behind Portraits of Hope (POH), an organization devoted to beautifying the world via large-scale civic and public art projects. 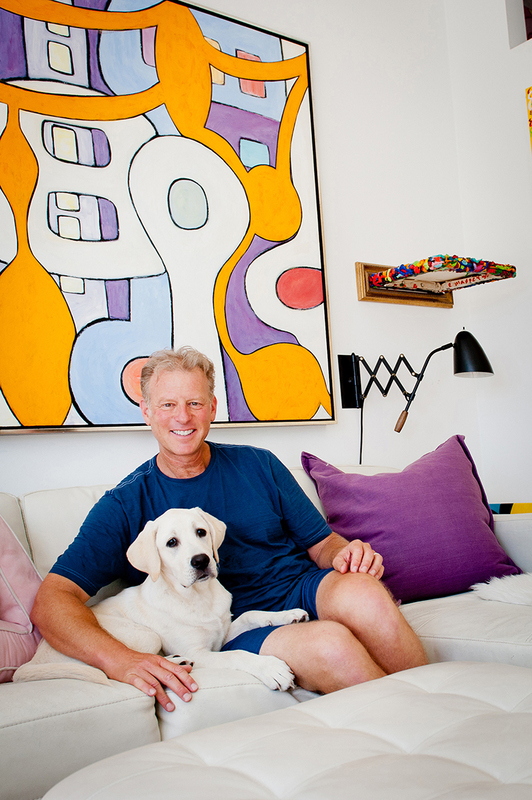 Artist Ed Massey at home with his dog, Milo. Living in Pacific Palisades, you have certainly viewed Massey’s work, whether it’s in the parking lot at Palisades Elementary or on the lifeguard towers at the beach. 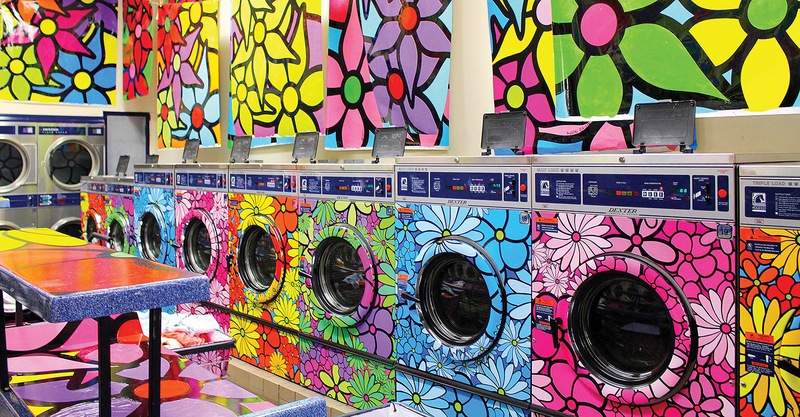 POH art is hard to miss—it’s colorful, whimsical and transformative. In fact, if you have children who have attended any of the local schools in the past 10 years or so, they have probably worked on a Portraits of Hope project. 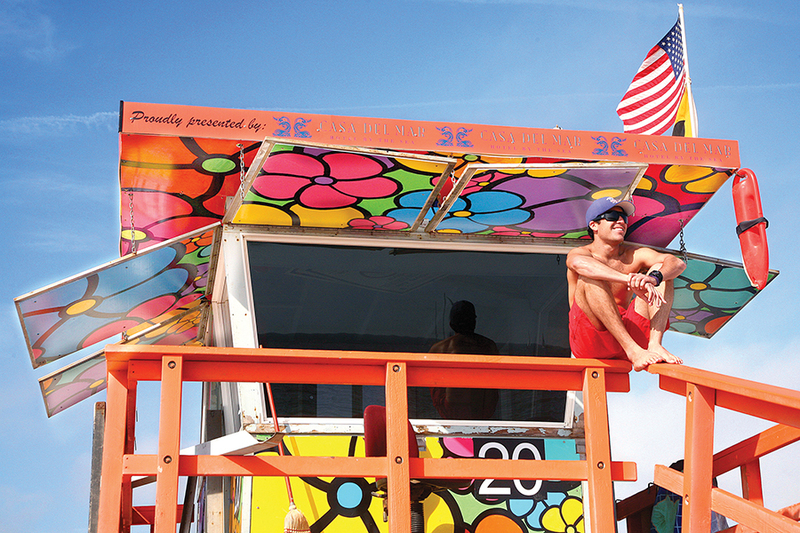 Though 2010’s Summer of Color (lifeguard towers from County Line to San Diego) was simply meant to spruce up the iconic blue lifeguard stations, there was an added, unexpected bonus. “Kids could remember better where they were if they got lost,” Massey told the Palisades News, because they could identify the colors and shapes on the tower from where they started. Massey emphasizes that his brother, Bernie, is an equal partner in all things related to Portraits of Hope. Though Massey gets more recognition since he is the face of the organization and the one who develops the art projects, Bernie has many responsibilities, including education and policy-related issues. 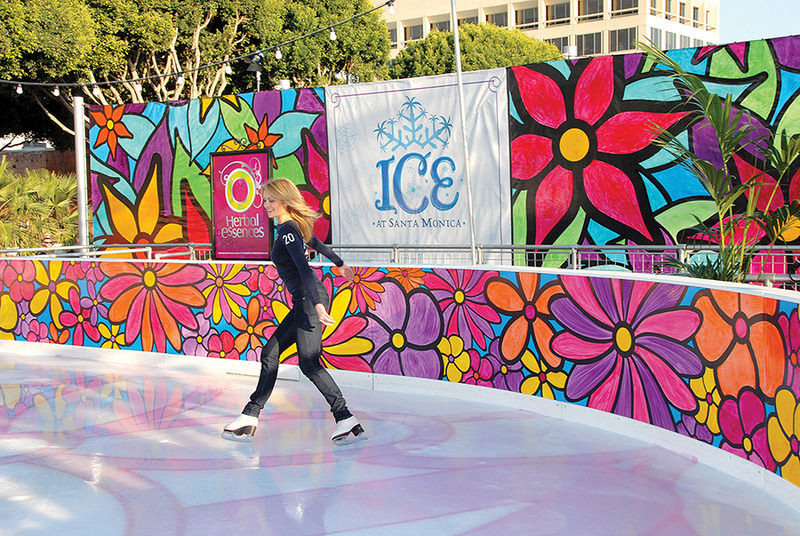 ed on vinyl panels—is intended to uplift people and places. Massey’s latest project is a partnership with the County of Los Angeles and the County’s Department of Animal Care and Control, which runs the seven County animal shelters (Agoura, Baldwin Park, Carson/Gardena, Castaic, Downey, Lancaster, Palmdale). Those shelters, in turn, work with dozens of city shelters throughout the county. “About four years ago, I came up with the concept of beautifying animal shelters. I wanted to do something magnificent, and call attention to pet adoption,” Massey said. “L.A. County houses more animals than almost anywhere else. Approximately 80,000 animals go through the shelter system each year. “They’re not the happiest environments, visually speaking,” he said. Fourteen thousand people are expected to take part in painting 8,000 pieces for the shelters. “Basically, the concept is to beautify all seven shelters, interior and exterior,” Massey said. He has designed special pieces to go inside each dog’s kennel, which he hopes “will illuminate some vibrancy” and draw attention to how wonderful the animals are. Another goal is that kids who participate will bring their parents to a shelter and hopefully leave with a pet. And each shelter’s staff will benefit as well. He’s also hoping filmmakers and photographers visit, and help spread the word about pet adoption. Massey is used to large installations. 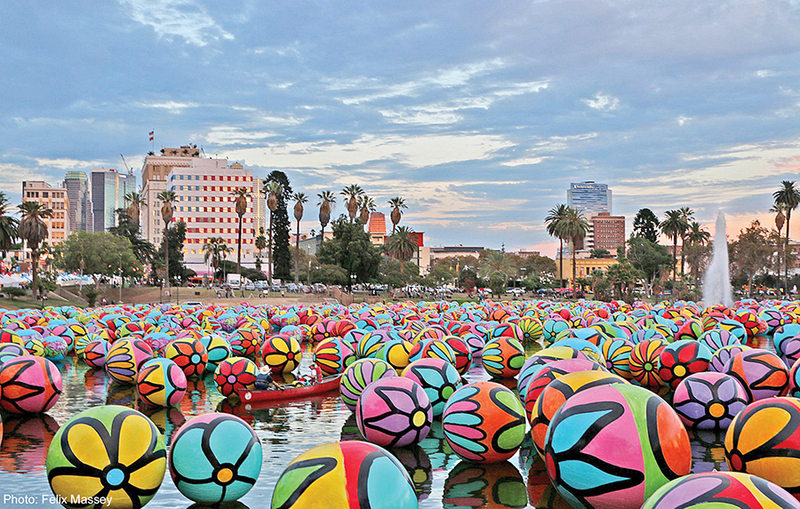 “MacArthur Park was the largest public art project anywhere in the world in 2015,” he said of “Spheres of MacArthur Park,” which featured approximately 3,000 large floating spheres in the park’s lake. “Once we get political approval, we have to hit the ground running,” Massey said. When MacArthur Park was greenlighted, “We had less than a year to complete our project because they had to put some piping in the water.” Had Massey waited, the project could have been delayed two years, or even lost forever. All donations and sponsorships are from private sources and groups who “want to do good for the community,” Massey said. POH has never had a fundraiser, and donations come in via word of mouth and through the brothers’ grassroots efforts. Donations of any kind and any size are welcome, as are hands-on volunteers. In-kind donations are crucial to Portraits of Hope’s success. The high-quality materials used on POH projects is due to the generosity of donors, which currently include Maddie’s Fund, Niagara Cares, the Goldrich Family Foundation, Vista Paint and Plaza El Segundo, where POH’s studio space is currently located. After a project is finished, vinyl panels are donated back to different organizations, such as schools and other nonprofits, to beautify their surroundings. They are also donated to groups that want to use the items for fundraising. Working with kids and volunteers is fun for Massey, and he enjoys the frenetic energy, quite different from the near-isolation he deals with when working on his own sculpture and paintings. Massey attended the Montessori school on Marquez Avenue, and jokes,“Maybe that’s why I became an artist.” The family moved to Beverly Hills before he started first grade. Though always interested in art, he didn’t begin to study it with passion until he was in graduate school at Columbia University. When asked which POH project is his favorite, Massey laughs, and gives the answer he was taught in art school.“It’s the next one.” He has been married to Dawn for 18 years. They moved to the Palisades about 10 years ago, and their two children attend local schools. Their house is ground zero for many POH projects. Currently, large spheres from the MacArthur Park installation hang in the backyard, and the entire home is filled with POH art. Massey grew up across the street from Dawn’s maternal grandparents in Marquez Knolls, and Dawn’s aunts used to babysit him and his siblings. During the week, school groups, pedi- atric care centers, after-school programs, special-needs kids and other kinds of groups visit. With the help of their seeing peers, even students from the Braille Institute are able to participate. The studio is divided into two sections: one for hands-on painting, the other for an educational lesson that focuses on the project’s mission. The kids split their time between the two areas. For the animal shelter project, experts from the field will discuss animal welfare, and what can be done to improve the lives of animals. On the weekends, the public is welcome to paint. Very few outings incorporate three generations, but Massey often sees grandparents painting alongside their kids and grandkids. Some nearby restaurants give discounts if people show up with paint on their fingers. “It’s as engaging and social as any activity,” Massey said, pleased that people are benefitting society while having fun. For more information, go to portraitsofhope.org. There will be an upcoming 24- hour paint-a-thon (date to be determined). Painting is free, but donations are always welcome. RSVPs are requested.